Dr David Orton has been an accredited Consultant Dermatologist since 2000. In November 2017 he resigned from the NHS after 29 years service and now only works in the private sector. As a result of this he has sufficient time to provide the high standard of care and attention to detail that he believes patients should expect. Dr David Orton is immediate past President of the British Society of Cutaneous Allergy and current Secretary of the European Society of Contact Dermatitis. He is a frequently invited lecturer at both National and International meetings on Contact Dermatitis and sits on the Advisory Board of EPIDERM as part of the Health and Occupational Reporting Network, University of Manchester. This provides information on occupational skin disease to Public Health England. He is the author of a Dermatology textbook, and has contributed chapters to other General Dermatology and Specialist Allergy textbooks. He is the author of over 45 peer reviewed papers and was invited to give evidence to the House of Lords Science and Technology Committee inquiry into Allergy. 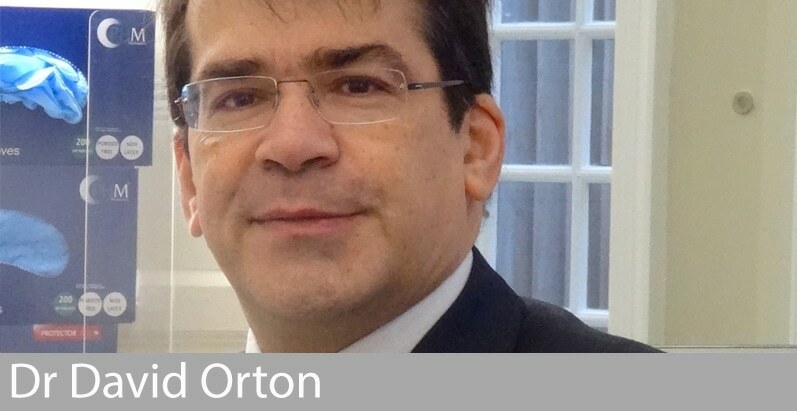 Dr Orton studied medicine at Charing Cross & Westminster Medical School, now the Imperial College School of Medicine in London. Whilst there he took an intercalated BSc in Psychology as applied to medicine obtaining BSc (Hons). After extensive training in General Internal Medicine he decided to specialise in Dermatology where he underwent clinical training between the Royal Free Hospital and the Royal London Hospital.